Let's say that a participant signed up for a $1,000 trip and has already paid a $200 deposit. Now, you want to change the final price for them, for example, because you are giving them a $100 discount. 1. 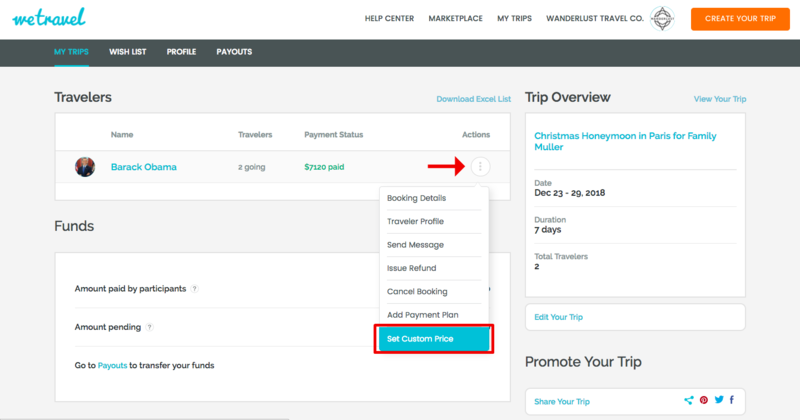 Go to your "Manage Trip" dashboard by clicking on "My Trips" and then on "Manage Trip". 3. Enter the new price for that participant, in our example "$900". 4. Click "Set Custom Price" and you are done!! An email will automatically be sent to the participant. The email contains a link to the payment site for the participant. Note: If the participant had already paid the full amount (e.g. $1,000) and you want to lower the price (e.g. 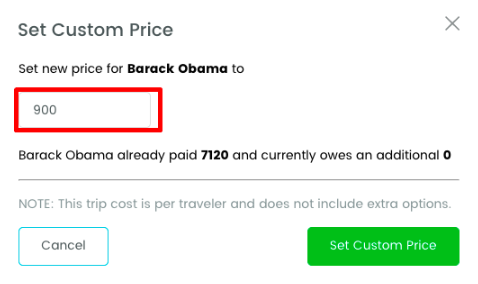 to $900), then you should press "Refund" in step 2, instead of "Custom Price". You can then initiate a partial refund, in our example for $100.